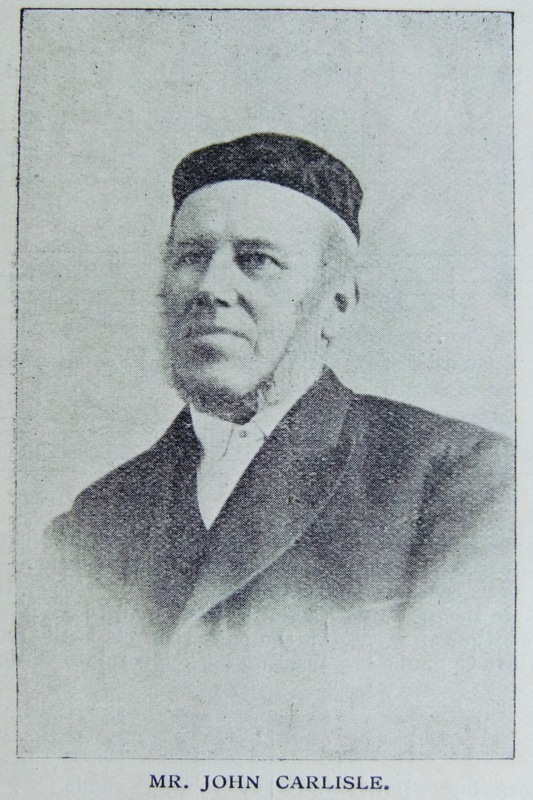 The Primitive Methodist Church has lost a most staunch and active member in the death of Mr. John Carlisle, of Scunthorpe, Lincolnshire, who passed away on April 3rd, 1902, at the age of seventy-one years. Our late friend and brother was born at Littleborough, near Gainsborough, nursed at Scawby, and schooled at Ashby. He was apprenticed to the tailoring business with Mr. Eccles at Brigg. He picked up the hairdressing business also at the same time, and finding it more to his mind pursued it for the rest of his life. He was converted under a sermon by a Wesleyan minister, in the Wesleyan Chapel at Brigg, when sixteen years of age. He went to live at Langworth, near Lincoln, and during the time of the Wesleyan Reform Movement joined the reformers for a while when twenty-three years of age. In 1853 he was married at Brigg to Miss Hannah Watkinson, how his widow, and they have spent forty-nine years of happy married life together. At the time of his wedding he came to reside at Ashby and there joined our Primitive Methodist Church. Alter four years of good health he had four years of serious and threatening illness, and by the doctor’s orders he removed to Worksop. Here he joined the Primitives, found the Revs. James Dawson and Henry Knowles, whose ministry was full of power and blessing to the people, and Mr. Carlisle laboured in Sunday school, class meetings, and all our church work for seven years in Worksop. He then removed to Parkgate, in the Rotherham Circuit, where for fourteen or fifteen years he was the leading spirit as class leader, school worker, and as society steward; and where for seven years, preaching, class and prayer meetings were held in his house. Mr. Carlisle’s house soon proved too small for the increasing number of adherents. Another place was found, a most undesirable place, too, in many respects, and this was used until an old Wesleyan Chapel was secured, where the cause spread mightily and sinners were converted every Sunday. The next was a most important and bold step, namely, the erection of the present handsome and commodious House of God in Lloyd Street, the land for which was secured by Mr. Carlisle and the Rev. John Dickinson, just before another offer was made for it. The chapel, school, and premises cost some £3,600, and to this day are a standing testimony of the wisdom and foresight shown by those who were actively concerned in the erection thereof. Mr. Carlisle came to Scunthorpe in 1879, and it was not long before he was at the front in all good work connected with his beloved Church. In the erection of the present house of worship at Scunthorpe, he was an earnest and ardent worker and giver, both of time and money. He has honourably filled nearly every position in the church open to laymen, chapel steward, chapel trustee, Circuit steward, society steward, and class leader; there was scarcely a wrong position for him. Not that he pushed himself to the front; there was no need of that. His good judgment, sound common sense, and eminently Christian character would be recognised wherever he went. He has served the town on the U.D.C. and in many other ways. He was for several years (fourteen or fifteen) an active and useful member of the Burial and Local Board of this town, and was much esteemed by all who knew and worked with him. He was a thorough-going, constant and consistent abstainer and Good Templar all his days; diffused temperance literature, organised and assisted in general temperance and Good Templar work and meetings, and by his cheerful and splendid example and teaching influenced many to be abstainers, to become Christians, and to join our church and to work for God and souls. Someone informed me the other day that in the early days of his first coming to, and residence in, Scunthorpe, he was the first to introduce harvest festivals and decorations and May morning breakfasts for the reduction of chapel debts, and he was exceedingly and constantly zealous for both the material and spiritual welfare of all the departments of the work of our Circuit and our Zion. He had much to do with commencing, organising, and working the Scunthorpe Pleasant Sunday Afternoon, assisted weekly at the meetings, and circulated many hundreds of good books on Christian and general literature. His home was ever open to the ministers of God, local and itinerant, and he knew most of the leading men of the Connexion personally. His place will be hard to fill, though being dead he will long live in the memory of those with whom he has been associated, and held sweet counsel, and with whom he lived and laboured. He regularly and daily conducted family worship in his house ever since he was married, a period of about fifty years, and when he was unable Mrs. Carlisle read and prayed in his stead. He had his faults, as all men have, more or less, but it is no stretch of the truth to say he was beloved by all with whom he came in contact. His bright testimony for Christ, his unflinching devotion to the cause of God, his hearty laugh and genuine wit, made him a man to be respected and beloved. He suffered in his later years from repeated attacks of paralysis, the first being about seven years ago. The second in September, 1901, another in October, 1901, another about a month or five weeks ago at Selby, and the last just before he expired. He was conscious of the nearness of death, but humbly and cheerfully and fully ready for the great and solemn change. His end was sudden but safe; God lifted him above the love of living and the fear of dying, and gave him a complete and glorious victory at the last. The county of Lincolnshire, the town of Scunthorpe, our own church, and the congregation in particular, are the poorer for his loss, but he has entered into his well-earned rest. While the earthly tabernacle crumbled and tottered to its fall, his spirit assumed a brightness and radiancy all divine, bearing witness, unmistakably, to the close relationship between himself and his Savour. His funeral was largely attended by friends from near and far. Bros. J. Scruton, C. Bray, of Parkgate, and Hy. Hornsby, of the Good Templars, paid tributes of respect to the memory of our departed brother in short addresses. The Revs. John Scruton and James Keightley were the ministers conducting the service, and with Mrs. Carlisle, in her great loss,the utmost sympathy and condolence is expressed. John was born abt 1831 to parents Thomas, a bricklayer, and Elizabeth. He married Hannah Watkinson (abt1829-1905) in early 1853 at Brigg, Lincolnshire.